Since childhood, she fell in love with painting. She was a big dreamer and loved everything beautiful, unique and interesting. Combining passion with technology, she has an MA in Programming Science and many years of experience as a Graphic Designer. After rigorous Technical Science, her job was like a fresh breath. She was really happy about being able to unleash her creativity in projects. However, she has never stopped dreaming about painting and step by step her life opened a new path for passion. In 2015, she enrolled in the “Illustrations” course in Saint Petersburg, which was love at first sight and the best foundation for her future career. It also opened a new World – the World of illustrations. Since then, she has been working as a freelance illustrator. 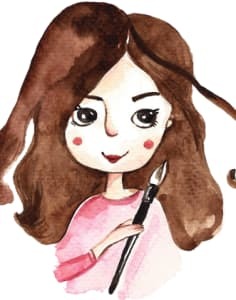 She already illustrated two children books, a cookbook, she created a variety of greeting cards, drew hundreds of illustrations and successfully launched more than 10 workshops in the UK. Her favorite material is watercolour but she never stops discovering something new. She loves to share her experience with others and believes that everyone is able to fulfill their dreams. I had an enjoyable time in Anna’s workshop. It was warm, friendly, and the step by step tuition and guidance was second to none. There was a lot of thought and attention to detail given especially the lovely kit we used during the class and to take home. The class met my expectations and more. Thank you very much.